On 10 April 1912 the Titanic set sail from Southampton dock, heading for New York with thousands of passengers and crew on board. 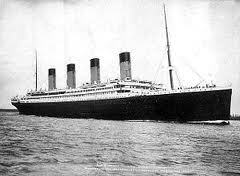 No one could predict the disaster about to befall the 'unsinkable' ship. RMS Titanic, then the largest ship in the world and widely believed to be unsinkable, left Southampton dock on 10 April 1912, bound for New York with more than two thousand passengers and crew members on board. Tickets ranged from £7 15s for steerage to £870 for the most impressive suites, which included two bedrooms, sitting room, private bathroom and a room for the servants, as well as a private balcony, the latest thing. Titanic's provisions for the journey included 75,000 lbs of fresh meat, 35,000 eggs, 40 tons of potatoes, 1,000 lbs of tea and 15,000 bottles of ale and stout. One survivor, a Mr. Beesley, told the Press Association when he reached New York that 'there was no panic or rush to the boats, and there were no scenes of women sobbing hysterically, such as one generally pictures happening at such times. The British inquiry held in the wake of the disaster found little fault with the Titanic's Captain, EJ Smith; though the ship was travelling at too high a speed they determined he was merely following an accepted method of navigation that had, until then, resulted in no loss of life. The inquiry did however criticise Stanley Lord, then master of the Californian, for failing to respond to Titanic's distress signals, suggesting that his ship may have 'saved many, if not all, of the lives that were lost' if he had done so. Lord was dogged by the accusation for the remainder of his life.